Mercury has made a rare transit in front of the Sun, the third such pass of 14 the planet will make this century. 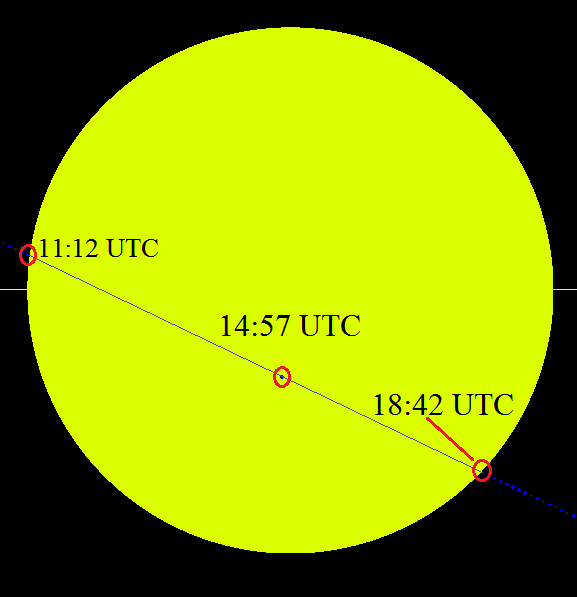 The little planet’s sojourn between Earth and the Sun lasted from 11:12 until 18:42 GMT. Mercury will not make another transit until 2019 and then 2032. The event was impossible – and dangerous – to view with the naked eye or binoculars, but astronomy groups worldwide were offering the chance view it through filtered telescopes. They show Mercury as a tiny black circle, smaller but darker than many sunspots, slowly traversing the Sun’s giant yellow disc. Mercury spins around the Sun every 88 days, but its orbit is tilted relative to the Earth’s. It is that discrepancy which makes it relatively rare for the three bodies to line up in space. From Western Europe, north-western Africa and much of the Americas, Mercury’s seven-and-a-half-hour glide across the Sun was visible in its entirety. The only land masses to miss out completely are Australasia, far eastern Asia and Antarctica. Because Mercury is so small – just one-third as big as Earth and, from our perspective, 1/150th of the Sun’s diameter – its transit can only be glimpsed under serious magnification; the “eclipse glasses” used by thousands of people to view last year’s solar eclipse will be useless. To avoid permanent eye damage, any telescope must be fitted with a solar filter before being trained on the Sun.